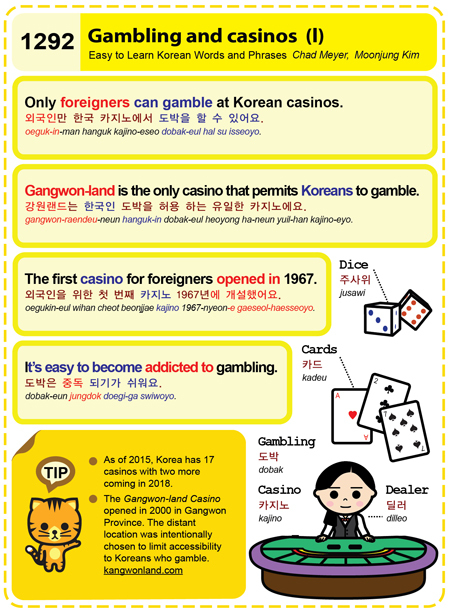 Easy to Learn Korean 1292 – Gambling and casinos. This entry was posted in Series and tagged cards, dealer, dice, gambling, gambling and casinos, Gangwon Province, Gangwon-land Casino, Gangwon-land is the only casino that permits Koreans to gamble., It’s easy to become addicted to gambling., kangwonland.com, Only foreigners can gamble at Korean casinos., The first casino for foreigners opened in 1967., 강원랜드는 한국인 도박을 허용 하는 유일한 카지노에요., 도박, 도박은 중독 되기가 쉬워요., 딜러, 외국인만 한국 카지노에서 도박을 할 수 있어요., 외국인을 위한 첫 번째 카지노 1967년에 개설했어요., 주사위, 카드, 카지노 by easykorean. Bookmark the permalink.